I received Organic Matcha- Green Tea Powder By KissMe Organics for free in exchange for my honest opinion. I have heard that green tea has many benefits, such as: stress relief, weight loss, and boost energy. I had never heard of Match Green Tea and if I had I didn’t realize there was a difference. Actually, one glass of matcha green tea is equal to 10 glasses of regular green tea! Now, I am NOT a green tea drinker so I was hesitant to even review this but it turns out I don’t have to drink it! I can incorporate it into my food EASILY!!!! Because matcha is a very finely ground powder it can be used in many foods you prepare. I have been sprinkling this stuff in all my meals while baking and cooking! As little as one teaspoon provides tremendous benefits! 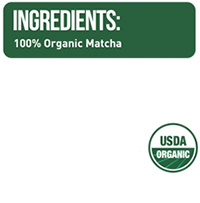 I really like that Organic Matcha Green Tea Powder from By KissMe Organics is made from 100% Organic Matcha and is certified USDA Organic. They actually test tea samples from several organic farms to ensure that they are bringing you the purest tea products available. The pouch this comes in is resealable and is easy to open and close. It seals nicely so I know it will keep it fresh. I love how easy it is to infuse Organic Matcha Green Tea Powder into my food so I get all the benefits of matcha without having to drink it! I also loved the Free 70 page Organic Matcha Recipe Guide from Kiss Me Organics! 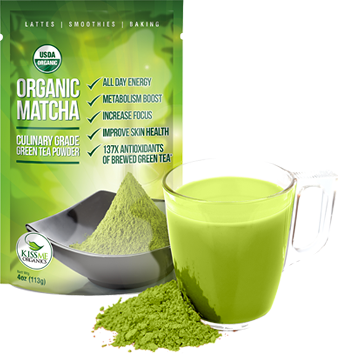 It is filled with great recipes and ideas to use Organic Matcha Green Tea Powder in your food. For instance, their was a pancake recipe. I did not follow the recipe because I have a Gluten Free Pancake Mix but I did add the 1 ½ tbsp. Matcha it suggested in the recipe! They turned out great and I received the benifits without having to drink Green Tea (which again I am not a fan of). Using matcha powder in breads, desserts, meats and cocktails will allow you to enjoy the flavors of the dishes you love…but with a kick. If you find the taste of the matcha too mild or too strong, simply adjust the measurements until you find the perfect combination for your taste buds. You don’t need to make each and every dish a beautiful bright green hue to take advantage of the benefits; as little as one teaspoon provides tremendous benefits. Whether you enjoy the taste of Green Tea or not you can use Organic Matcha- Green Tea Powder By KissMe Organics daily and enjoy the benefits from consuming it! How much matcha should we take daily, 1 tsp, 2 tsp.